If you ever spent time in hospital as a child, you'll know how horrible it can be to be so far from home, unwell and surrounded by strangers. A young designer by the name of Joshua Barnes has come up with a cosy patchwork quilt that uses augmented reality tech to deliver comforting messages from mums and friends through the medium of animal characters. How does it work? 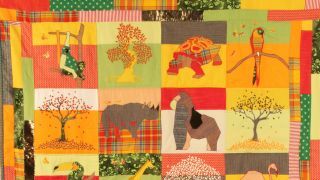 Animal characters are patchworked on to the quilt, each of which can be assigned to a friend or family member. They then leave messages for the patient, who can use a smartphone or tablet to access them using Arusma's AR tech. That might not sound to warm and fuzzy but research has shown that the combination of these heartfelt messages, and the physical element of holding and cuddling the quilt stop the child from feeling lonely. What a lovely, lovely idea - and one that won Barnes a Future Pioneer award from the Design Council. Keep that warm and fuzzy feeling alive with another dose of blips.